Cambodian Green Giant Eggplants. Very large tear drop shaped fruits are very pretty. Light green with dark green mottling. Bottoms are fluted. Heirloom Seed Packet. Very large tear drop shaped fruits are very pretty. 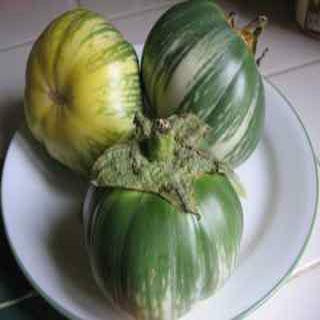 Great heirloom eggplants! Light green with dark green mottling. Use in Asian style cooking and soups.